Lyco Works and C-Synergies co-chaired the Atlanta IP Think Tank once again this year, hosted by Georgia State University College of Law. Bringing together around 35 individuals from local larger companies, representatives from Atlanta’s three major schools with technology transfer functions, Emory, GA Tech, and GSU, as well as representatives from the Centers for Disease Control and several sponsoring law firms. The individuals included senior patent attorneys, as well as business development specialists, dealmakers, and senior R&D leadership. Dr. Sam Khoury, president of Inavisis Inc. and IP appraisal expert, presented an illuminating study comparing global economics, investment, and how that related to those nations’ national IP strategies. Pricewaterhouse Coopers gave an informative overview of patent litigation and opinions of IP gathered from 1,700 CEOs around the world. The second half of the morning, we formed teams and applied ourselves to tackle the impact of technology and global megatrends on future IP strategy. The topics for the Think Tank teams to work on were carefully selected to be thought provoking and challenging. For instance, artificial intelligences (“AI”) already anticipate which songs a listener might enjoy based upon prior selections. It’s likely that the next step will be for the AI to actually compose customized music ab initio that the listener might enjoy, also based upon their prior music selections. Extrapolating into the future, the Think Tank anticipated patentable inventions created by AIs. These might include, for instance new drug molecules contrived to dock with enzymes, for example. What is the legal framework for IA creations, given that the law appears to read that an inventor can only be a person, and not a machine? Who would own the invention? and how could it be transferred or monetized? 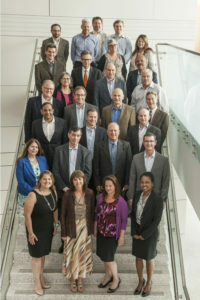 Another group worked on what a National IP Strategy would look like for the United States, while two other groups worked on: a) lower-cost and reduced risk patent litigation, and b) advice to patent offices and national patent policy in the light of the escalating pace of new technology development, such as spintronics, AI, and quantum computing. Two papers are being drafted that we hope to publish in leading IP journals in due course. Atlanta has been referred to as a ‘World Class hub for technology and mobility” and is “one of the fastest-growing, high-tech urban centers in the nation . . . leading the way in creating a national center for innovation and industry growth”. In this regard, the Atlanta IP Think Tank is part of a much broader initiative that includes GSU, GA Tech, and Emory universities, as well as local enterprises, outside counsel, and government organizations, intended to recognize Atlanta as a world class IP Center of Excellence. Corrine and I would like to thank our gold level sponsors including Baker Hostetler, Cantor Colburn, Smith Gambrell & Russell, Emory University, GSU, and the Licensing Executive Society. For more information, please contact Jason Lye or Corrine Sukiennik, co-chairs of the IP Think Tank.